Benjamin Louis Cardin (born October 5, 1943) is an American politician serving as the senior United States Senator from Maryland, first elected to that seat in 2006. A member of the Democratic Party, he previously was the U.S. Representative for Maryland's 3rd congressional district from 1987 to 2007. 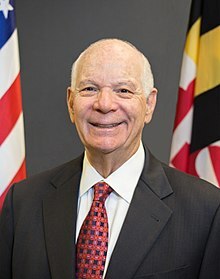 Cardin served as a member of the Maryland House of Delegates from 1967 to 1987 and as Speaker of the Maryland House of Delegates from 1979 to 1987, the youngest person to hold the position in history. In his half-century career as an elected official, he has never lost an election. Cardin was elected to succeed Paul Sarbanes in 2006, defeating Republican Michael Steele, the Lieutenant Governor of Maryland, by a margin of 54% to 44%. He was reelected in 2012 taking 56% of the vote. He became a senior U.S. Senator on January 3, 2017 upon Barbara Mikulski's retirement. Cardin won reelection to a third term in 2018, taking 65% of the vote. In 1986, with Congresswoman Barbara Mikulski mounting what would be a successful bid for the U.S. Senate seat vacated by retiring Senator Charles Mathias, Cardin ran for Mikulski's seat representing the 3rd Congressional District, which covered a large slice of inner Baltimore, as well as several close-in suburbs. Cardin won the Democratic nomination with 82 percent of the vote—the real contest in this heavily Democratic district. He won the general election with 79 percent of the vote against a perennial candidate, Republican Ross Z. Pierpont. Cardin was reelected nine times, rarely facing serious opposition and even running unopposed in 1992. In the 2000 round of redistricting, his district was redrawn to add significant portions of Anne Arundel County, including the state capital of Annapolis. His last two opponents hailed from Anne Arundel and nearly carried the district's portion of that county. In 1998, Cardin was appointed Chairman of the Special Study Commission on Maryland Public Ethics Law by the Maryland General Assembly. In 1997, he co-chaired the Bipartisan Ethics Task Force in an effort to reform ethics procedures in the House of Representatives. He also held leadership positions on the Organization, Study and Review Committee and the Steering Committee of the House Democratic Caucus, and served as Senior Democratic Whip. Member of the Ways and Means Committee. Ranking member of the Trade Subcommittee. Member of the Human Resources Subcommittee. Chairman of the Commission on Security and Cooperation in Europe. On April 26, 2005, Cardin announced that he would seek the U.S. Senate seat of long-standing senator Paul Sarbanes (D-MD), following the announcement by Sarbanes that he would not be running for re-election in 2006. On September 12, 2006, Cardin faced a challenging primary battle with other Maryland Democrats, including Kweisi Mfume, Josh Rales, Dennis F. Rasmussen, and Allan Lichtman. Cardin won, however, with 44 percent of the vote, compared to 40 percent for Mfume, five percent for Rales, and two percent for Rasmussen. He was declared the winner after just two percent of the precincts had reported. Cardin won election on November 7, 2006, defeating Republican challenger Michael Steele 54 percent to 44 percent. Cardin became the third consecutive Representative from Maryland's 3rd Congressional District to be elected Senator (following Sarbanes and Mikulski). Cardin was re-elected for a third term in 2018. Cardin holds honorary degrees from several institutions, including the University of Baltimore School of Law (1990); University of Maryland, Baltimore (1993); Baltimore Hebrew University (1994); Goucher College (1996); and Villa Julie College (2007). From 1988 to 1995, he chaired the Maryland Legal Services Corp. Through much of his political career, he has continued to work with law policy. From 1988 to 1999, Cardin served on the St. Mary's College of Maryland Board of Trustees, and in 2002, he was appointed to the St. Mary's Advisory Board for the Study of Democracy. In 1999, he was appointed to the Goucher College Board of Trustees. In 2002, Ben's 32-year-old nephew, Jon S. Cardin, who graduated from University of Maryland law school in 2001, was elected as a Delegate representing District 11 of western Baltimore County. With state legislative District 11 overlapping Congressional District 3, there were two Cardins on the ticket in this area in 2002. Present at Jon's swearing in was the oldest living former member of the House of Delegates at 95 years of age, Meyer Cardin, Jon's grandfather and Ben's father. Also in attendance was Ben himself, who stated, "The next generation's taking over." After Ben announced that he would vacate his Congressional seat to run for the U.S. Senate, Jon Cardin stated that he was exploring a campaign for his uncle's Congressional seat, though he ultimately decided to seek reelection to the House of Delegates. For many years Cardin served on the Board of Trustees for St. Mary's College of Maryland. He was very active on the board and also played key roles in the establishment of the Center for the Study of Democracy at the college, where he also served on the advisory board. ^ a b 2012 General Election Results, Maryland State Board of Elections, November 28, 2012. Retrieved January 16, 2018. ^ a b c d e f g h Official Congressional Directory (114th Congress, 2015–2016 ed.). Washington, D.C.: United States Government Publishing Office. 2016. p. 123. ISBN 9780160929960. OCLC 951612101 – via Google Books. ^ Battle, Robert (November 22, 2006). "1". Robert Battle's genealogy projects. RootsWeb (Ancestry.com). Retrieved August 23, 2018. ^ a b c "About Ben Cardin". Ben Cardin for Senate. Archived from the original on February 8, 2009. ^ "Meyer Melvin Cardin, MSA SC 3520-14430". Archives of Maryland (Biographical Series). August 1, 2005. Retrieved August 23, 2018. ^ a b c d e "Senator Benjamin L. Cardin : Maryland". Cardin.senate.gov. Archived from the original on August 28, 2010. Retrieved August 23, 2018. ^ "Senator Benjamin L. Cardin : Maryland". Cardin.senate.gov. Archived from the original on April 25, 2007. In 2002, as a member of the House, he voted against giving the President the authority to go to war in Iraq. ^ a b Bennett, John T. (April 16, 2015). "Thrust Into Iran Bill Talks, Cardin Delivers". Congress. DefenseNews. Sightline Media Group. Retrieved August 24, 2018. ^ "Unofficial 2006 Gubernatorial General Election results for U.S. Senator". Maryland State Board of Elections. Archived from the original on October 4, 2006. Retrieved August 29, 2010. ^ "2006 Elections". You Decide 2006. Fox News. February 20, 2007. Archived from the original on February 21, 2007. ^ "Portman and Durbin Launch Senate Ukraine Caucus". Rob Portman - Newsroom (Press release). February 9, 2015. Archived from the original on February 11, 2015. Retrieved February 11, 2015. ^ "Ben Cardin, US Senator for Maryland". cardin.senate.gov. Archived from the original on March 28, 2007. ^ " About CSCE: Commissioners". Commission on Security and Cooperation in Europe. Retrieved 2016-12-29. ^ "Board of Visitors". University of Maryland Francis King Carey School of Law. 2016. Retrieved December 29, 2016. ^ "Klaus Iohannis a decorat opt congresmani americani cu Ordinul Steaua României în grad de Comandor". Adevărul (in Romanian). Bucharest, Romania. June 9, 2017. Retrieved April 29, 2018. ^ Peia, Florentina; Iacob, Simona (June 9, 2017). Purcarea, Vicentiu; Pandea, Razvan-Adrian (eds.). "President Iohannis and U.S. congressmen discuss Romania's inclusion in Visa Waiver programme". Bucharest, Romania. Agerpres. Retrieved April 29, 2018. ^ "Cardin, Sarbanes get high marks for Obama support; Mikulski's attendance slips". Baltimore Sun. ^ "2013 Vote Ratings: The 15 Most Liberal Senators". National Journal. Archived from the original on February 9, 2014. Ballotpedia offers an explanation of the ratings, with a full list of the 2013 ratings of the Senate and House: . ^ Linn, Leticia (November 3, 2006). "Md. Senate Contenders Differ Over Death Penalty". Southern Maryland Online. ^ "Warren, Klobuchar call on FTC to curtail use of non-compete clauses". The Hill. March 20, 2019. ^ "USPSA" (PDF). Public Service Academy. Archived from the original (PDF) on December 30, 2008. ^ a b Quinlan, Paul (July 1, 2011). "Sen. Cardin Hopes to Bridge Divide Over Water". The New York Times. Retrieved October 31, 2014. ^ Thomsen, Jacqueline (October 11, 2018). "Bipartisan bill would block foreign adversaries from owning US election vendors". The Hill. Retrieved October 11, 2018. ^ Fleischer, Jodie; Leslie, Katie; Piper, Jeff (October 11, 2018). "Measure Seeks to Prevent Foreign Ownership of US Elections Firms After Russian Invests in Maryland Elections Vendor". NBC Washington. Retrieved October 12, 2018. ^ "Benjamin Cardin on Gun Control". www.ontheissues.org. Retrieved March 21, 2019. ^ Fritze, John. "Cardin, Mikulski weigh in on Senate guns filibuster". baltimoresun.com. Retrieved October 4, 2017. ^ Zengerle, Patricia (2016). "Exclusive: U.S. stopped Philippines rifle sale that senator opposed - sources". Reuters. Retrieved October 4, 2017. ^ Cardin, Senator Ben (October 2, 2017). "We need to stop the carnage. More talk and prayers will not save lives. Only action and real changes in our laws can. #LasVegas #GunSafety twitter.com/SenatorCardin/status/914884402873761792 ..." @SenatorCardin. Twitter. Retrieved October 4, 2017. ^ Carney, Jordain (October 2, 2017). "Dem senator pitches ideas for gun control after shooting". The Hill. Retrieved October 4, 2017. ^ Seitz-Wald, Alex; Sarlin, Benjy. ""Bump stocks" for rapid fire are legal. Senators ask why". NBC News. Retrieved October 4, 2017. ^ "Sen. Ben Cardin (D)". National Journal Almanac. Retrieved August 15, 2014. ^ "Benjamin Cardin - Israel". The Political Guide. March 27, 2012. Retrieved December 29, 2016. ^ Kontorovich, Eugene Kontorovich Eugene; Eug2017-08-31T20:05:00+00:00, Eugene. "Israel anti-boycott bill does not violate free speech". The Washington Post. Retrieved August 31, 2017. ^ Greenwald, Glenn; Grim, Ryan (July 19, 2017). "U.S. Lawmakers Seek to Criminally Outlaw Support for Boycott Campaign Against Israel". ^ "Final Vote Results for Roll Call 541". ^ "China 'Voids' Hong Kong Rights: Beijing abrogates the 1984 treaty it signed with Britain to guarantee the city's autonomy". The Wall Street Journal. December 14, 2014. Retrieved July 22, 2016. ^ "Final Vote Results for Roll Call 239". ^ "Text of S. 3804 (111th): Combating Online Infringement and Counterfeits Act (Reported by Senate Committee version) - GovTrack.us". GovTrack.us. Retrieved May 5, 2017. ^ a b c "CNBC Interview". CNBC Interview. ^ "Cardin bill angers whistleblower advocates". November 24, 2011. ^ Linn, Leticia (November 3, 2006). "Candidate Profile: U.S. Senate: Ben Cardin (D)". Southern Maryland Online. ^ " Congressman's son dies suddenly", Google Groups, March 25, 1998. ^ "Eric Bromwell - Maryland House of Delegates". ericbromwell.com. Archived from the original on November 3, 2004. Retrieved May 5, 2017. 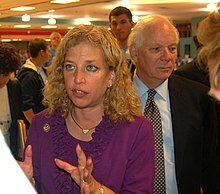 Wikimedia Commons has media related to Ben Cardin.